Who would have known that Canna Lily tubers are edible? You of course, once you've tried this remarkably decorative combination on your patio. 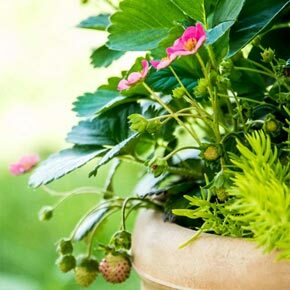 The tall canna is the thriller of course, but with basil, chard and peppers as fillers, and sweet strawberries as spillers, this combination will not only delight you this season, it will inspire you to use edible plants more creatively for seasons to come. 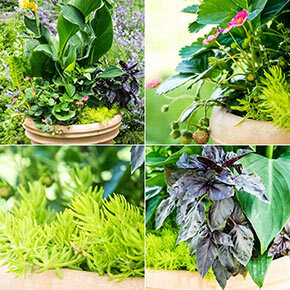 Adding edible plants to your patio pots is so much fun, but rarely this beautiful. Children especially love the surprise of a pepper or strawberry to pluck and share. You'll be amazed at how this assortment will give you color all season, and the fact that it's edible makes it quite the conversation piece. Collection contains one each (enough for a 14-16" pot) of: Yellow Cannova® Canna, Dark Opal Basil, Toscana Ornamental Strawberry, Redskin Pepper, Neon Bright Lights Swiss Chard, Sea Star Sedum. About our Glenwood Annual Collections: We are so pleased to have partnered with Kathy Charvat, Naturalist at Glenwood Gardens, part of Great Parks of Cincinnati, to design unique container collections for us; combining annuals, tropical plants and even edibles for you to try on your patio or terrace. 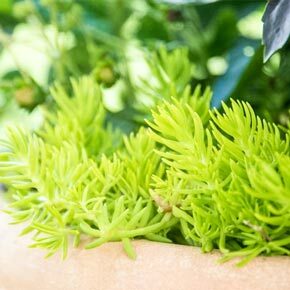 Her imaginative selections will encourage you to explore plant combinations you may never have thought of attempting, as well as attract hummingbirds, bees and the envy of visiting friends and neighbors. 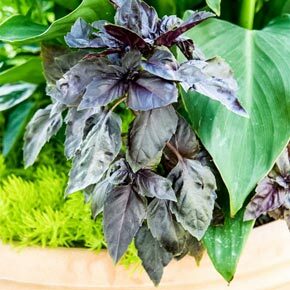 Kathy's enthusiasm for the unique and well-coordinated (or as she puts it "plants that play well together") is infectious and her eye for subtle color relationships is unmatched.